Bluff Villas are in the perfect location! Conveniently located to all that South Beach offers, including shops, restaurants like the Salty Dog, seasonal live entertainment, and much more. 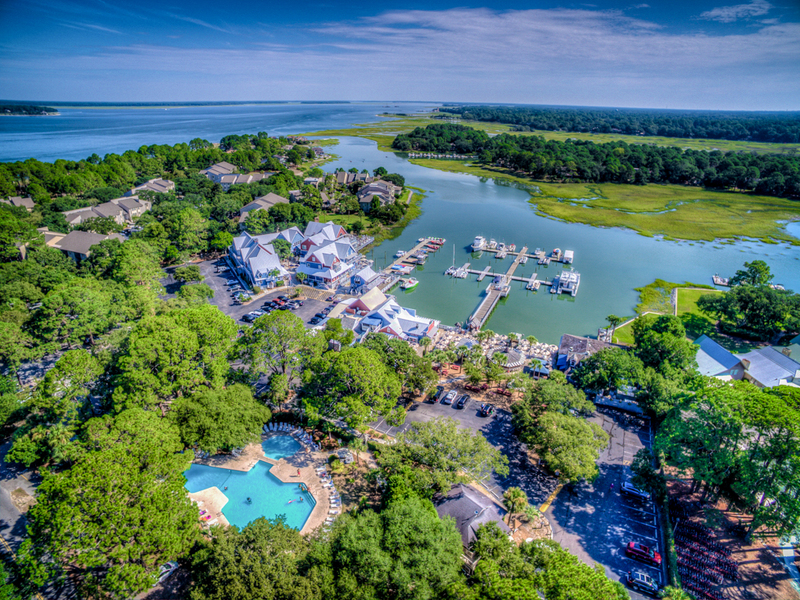 Located between Calibogue Sound and the Braddock Cove inlet, it is a favorite area for watersports enthusiasts. With nautical décor throughout, this first floor 2 Bedroom, 2 bath Villa has been tastefully renovated to include a new kitchen with granite counters, stainless steel appliances,and a bar with seating for 4, as well as updated flooring. The Living Room leads out to a patio with seating for 6 and a gas grill which is overlooking a lovely landscape. The master boasts king bedding and an en-suite bath. The second bedroom is furnished with 2 twin beds and a full bath as well. This villa is steps away from the beach and the South Beach Village which offers a swimming pool, bike rentals and tennis club. This is our 2nd time to stay in this particular condo and it was even more enjoyable the 2nd time. It has charm and very modern updates, also has a homey comfortable feeling liked you arrived home. The decor is superb and and very comfy. 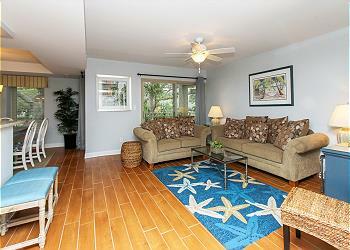 The location is perfect, close to shopping, Salty Dog, bike rentals, tennis/pickle ball. We are already planning our next visit! Great place with great location. Wow, recently remodeled Condo. New TV's and furniture! 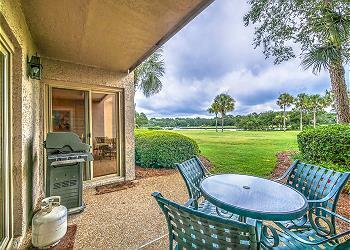 Awesome location to South beach, Harbor Town and golf. Condo came with pool access and daily tennis. Looking forward to returning. This was not our first trip to Hilton Head but our stay at this villa has definitely made the list of must repeat AGAIN! The location just steps away from the Calibogue Sound was perfect. I could go for sunrise runs on the beach and be accompanied by a dolphin not 15 feet off the shore keeping every stride. The villa was immaculate and perfectly decorated. I loved the kitchen and counter space for a "fix your own" or just a walk across the property for many choices of great meals at the local restaurants. Sea Pines is a dream come true and this villa is smartly priced and worth every penny. Wow wow wow!! This is our 3rd time staying in this unit and we are blown away by the condos updates!! New flat screens and an unbelievable updated kitchen with new granite countertops!! After a year away we are so glad we came back!! Great location close to everything in South Beach Marina!! 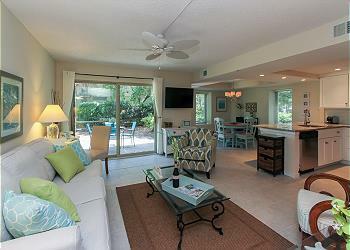 We are new to Hilton Head, have vacationed a number of years at Myrtle Beach. We always search out nice property because our vacation is very important to us. We came on this property because friends had stayed here and recommended it to us. The condo is lovely, comfortable, and roomy for 4 adults. The condo is right across the parking lot from the Salty Dog. There are 2 beaches within walking distance and another one about 15 minute bike ride away. You are probably 100 ft off the bike/ running path.close enough to be convenient but not intrusive. Sea Pines is a beautiful area. The residences and other condos are well taken care of. The landscaping is beautiful. This villa had been remodeled shortly before we stayed. A new ceiling, cabinets and counter tops were installed. We found it to be very comfortable, with all the amenities you would want. 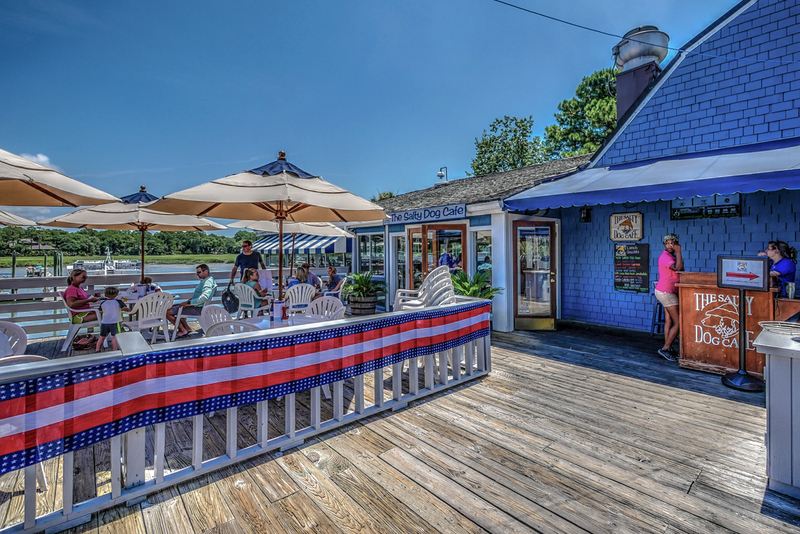 It is a very short walk out the back door to the Salty Dog. Bike rentals are just a little beyond the Salty Dog. There is a trolly by the bike rental that takes you to some of the sites and restaurants you might want to visit on the south end of the island. There are two bedrooms, laundry, and comfortable living area blending into the kitchen. One bedroom has twin beds. You'll use the bathroom across the hall from. The other bedroom, the master, has it's own bathroom inside. WiFi is included as well as a big screen TV mounted on the wall. It's basic TV, but there were a few DVD's to watch. There's enough to do that I doubt you'll miss TV. New Favorite Place to Stay! I have been to Hilton Head several times and stayed at many nice places, but this was our favorite spot! You cannot beat the location, just walking distance to the beach. Amenities such as the pool, tennis courts, bike rentals, shopping, and dining are all within a short walk. The condo itself was very nice, with a beautiful updated kitchen and dining room that we enjoyed as a family. I would recommend this condo to anyone looking for the perfect beach vacation! We have so many good things to say about this Villa! We have stayed at many different locations all over Hilton Head but this was our first time staying in South Beach. We picked the perfect location because the beach is just steps away as well as the pool, bike rental, food, and convenience store. 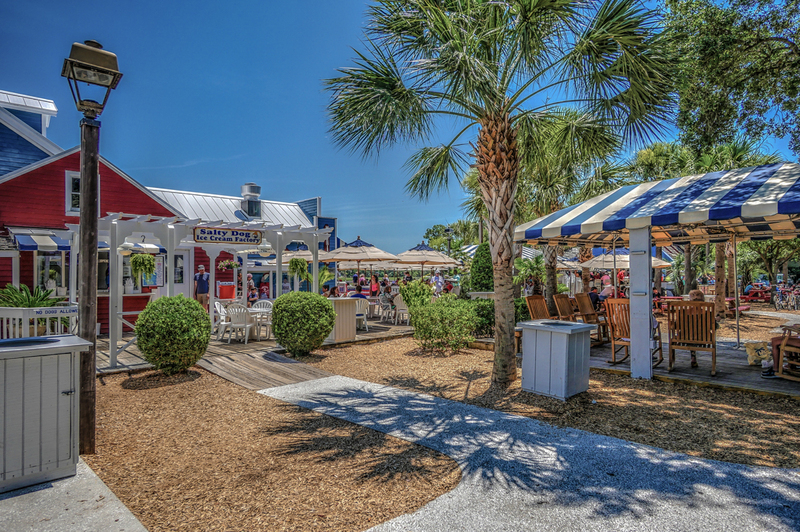 We felt like locals every morning because we walked out the back door to grab coffee at the Salty Dog on the way to the beach! There is a grill and beautiful outdoor space off the back that is private and comfortable. The interior is open and the kitchen is very large with upgraded appliances. We could not be happier and will be coming back to 1654 Bluff Villa on our next trip! !